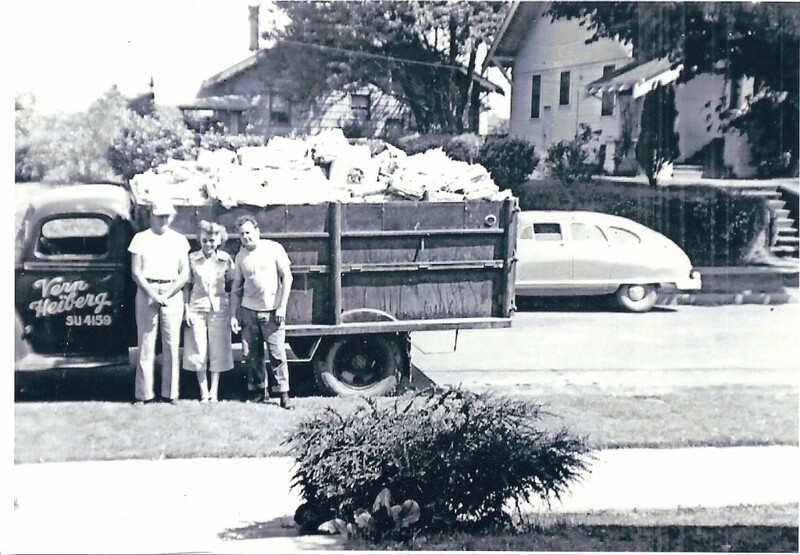 Heiberg Garbage & Recycling, LLC is a family owned company that was born in 1947 when Vern Heiberg acquired a route in the Sellwood-Moreland neighborhood of Portland. Vern purchased the route from a newspaper ad and with the help of his wife, Marian, managed the route and paperwork. Marian took care of the books and Vern ran the collection route. They purchased their first compactor truck in 1967. When Vern’s son, Bruce, purchased the company from his father in 1973 at the age of 19, it was a two person route. Brian Heiberg, another of Vern’s sons, joined Bruce in the late 70’s as an employee and later became a partner. The third generation of the Heiberg family is active in the family business and plans to carry on the tradition for many years to come. Photo: Vern Heiberg with Helen & Bud Walsh posing with Vern’s very first collection truck. Today, Heiberg Garbage & Recycling, LLC strives to provide quality customer service at fair rates. We want our customers to be happy. We are also active members in our community. We participate in and donate our time, trucks and drivers to numerous neighborhood clean ups, Boys & Girls Club events, Boy Scouts events and P.I.L. High School athletic events. Heiberg Garbage & Recycling, LLC currently services residential areas of Sellwood, Westmoreland, Hollywood, Buckman, Brooklyn, Kennelworth, Laurelhurst, Hillsdale, Irvington, Argay, Madison South, St. Johns and Maywood Park. In addition, we service commercial, multi-family and drop boxes throughout the entire Portland area.